The UN has always had problems deploying its largest, infantry-heavy missions. 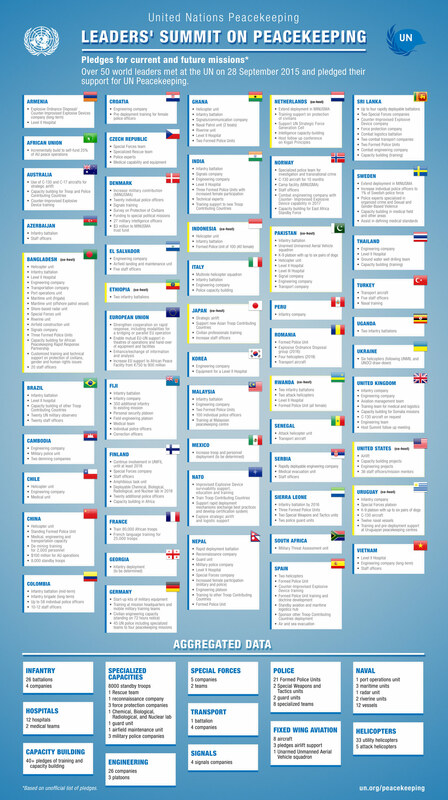 The 2015 Leaders’ Summit on Peacekeeping and this week’s 2016 UN Peacekeeping Defence Ministerial in London are Member State driven initiatives to do better. Broader participation in contributing to missions is a key part of rapid deployment as well as reaching full strength. A Global Peace Operations Review analysis of data from UN peacekeeping operations over the last 25 years indicates that modern UN peacekeeping missions, on average, take just over ten months to reach their peak deployment. In Africa, where countries on the continent are often left to the take the lead, average time to deploy is worse -- almost twelve months to reach peak deployment. In fact, the average non-African mission in our analysis reached peak deployment in less than seven months, the fastest of any grouping. Moreover, few missions actually reach their full authorized strength. The average peak deployment has been about 92.5 per cent of the total authorized personnel ceiling, both globally and in those missions in Africa (with significant variation between missions). European missions, by contrast, come much closer to full deployment with an average peak of 98 per cent of total authorized personnel. European missions have also tended to reach peak deployment more quickly than others, within 9 months on average. As Alischa Kugel has pointed out, it is not only geography that plays a role in slow or weak deployment. These African missions struggling to reach full strength are deployed in high-risk environments. Missions that are slow to deploy are often complicated multi-dimensional missions. European locations with good infrastructure facilitate rapid deployment, whereas countries like CAR, DRC, Mali, and South Sudan are logistically challenging with fewer good roads. European contingents are also better equipped and prepared to be highly mobile, whereas many other contributors rely on the UN to arrange their transportation, which involves slow contracting processes. For this analysis, GPOR examined the monthly personnel levels, both authorized and actually deployed, on every UN peacekeeping mission that had UN Security Council Resolutions authorizing specific increases in personnel since November 1990, which is the earliest available UN data. The primary personnel type of each mission was used in the analysis. For example, UNMIBH was a police mission with a minimal military component and so data on authorized and actual levels of police was used. This analysis excluded missions without specifically authorized personnel ceilings (e.g. most missions before circa 1998), missions with less than 1,000 authorized personnel, missions that lasted less than a year, and missions that were dedicated to personnel drawdowns rather than deployments. 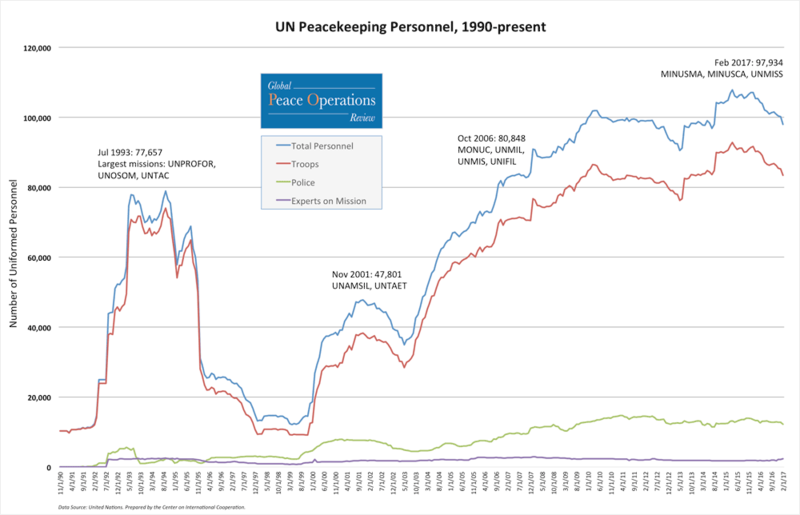 Within these parameters, this analysis included 22 UN peacekeeping missions taking place between 1990 and the present day, with 43 total instances of increases in authorized personnel. You can download the full data set UN PKO Peaks After Increased Authorizations as an Excel file. A few cases best illustrate the deployment gap between those missions with active European participation and those where African nations are in the lead. As Richard Gowan noted in his 10 Trends in Peace Operations essay, when the Security Council mandated the reinforcement of the UN force in Lebanon in 2006, European nations got the troops on the ground in a matter of months. The slow processes in Mali and CAR highlight the need for the UN to develop more consistent rapid strategic deployment capabilities, both to launch new missions and reinforce old ones in crisis – or alternatively assist better-placed regional organizations to strengthen their rapid deployment systems as a precursor to blue helmet missions. While the AU was able to play this role in Mali and CAR, many of its units were short on the equipment they needed in the early phase of operations, and the missions were also prey to funding problems. These issues should not be allowed to hinder future deployments. 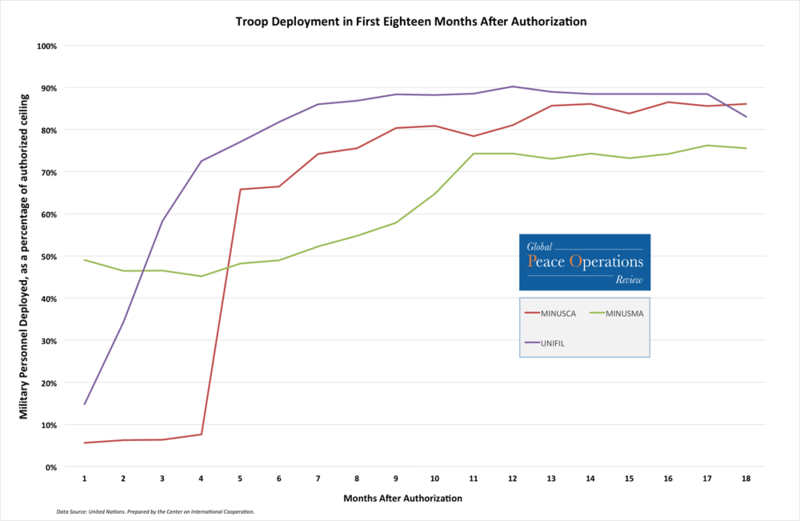 Modern UN peacekeeping missions, on average, take just over ten months to reach their peak deployment. Gowan has also made the case how to increase European Military Contributions to Peace Operations in Africa. These arguments are not just historical. With the crisis in South Sudan and the UN Security Council in August 2016 increased the mandated strength of UNMISS by 4,000 troops. These challenges are clear and present ones for UN peacekeeping. UNMISS is another example of a particularly pronounced deployment gap in a high-risk environment – a scenario that has played out in several other African missions such as UNISFA and MINUSMA. 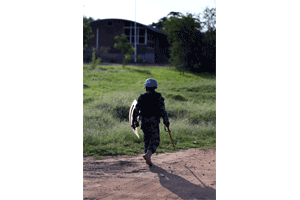 As GPOR has previously written, UNMISS was authorized to deploy 5,500 additional troops and 423 additional police as of December 2013, as the ongoing crisis in South Sudan escalated. Six months later, the mission was only at three-quarters of its authorized strength. 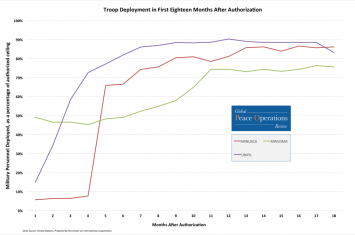 It took about 21 months for UNMISS to reach its peak deployment after the authorized personnel increase of December 2013. The situation in South Sudan has deteriorated further in recent months, prompting the Security Council to authorize a new total of 17,000 uniformed personnel to staff UNMISS. And while we cannot draw a direct causal line from relatively slow or low deployment to an intensification of conflict, it is worth bearing in mind – when discussing any mission – the well-documented relationship between peacekeeper presence and actual peace, whereby greater numbers of UN troops and police have been strongly associated with reduced civilian deaths and battlefield deaths. As the Member States meet in London to review their pledges from 2016, they should underline the greater role that troop contributing countries might play to improve the capabilities of UN peacekeeping. Of course, this is not just a numbers game. The commitment of transport, engineering, intelligence, medical, and transport units to a peacekeeping mission can make significant contributions to its effectiveness. 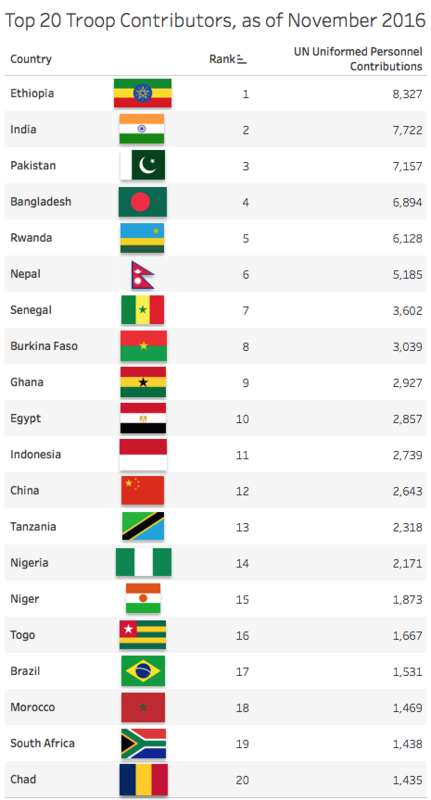 However, the latest DPKO statistics show that there are no European countries in the Top 20 contributors of uniformed personnel to UN peacekeeping missions. This has raised questions about whether European countries could or should do more. Data published by the CIC in its 2007 edition of the Annual Review of Global Peace Operations shows how this situation has changed in the last decade. 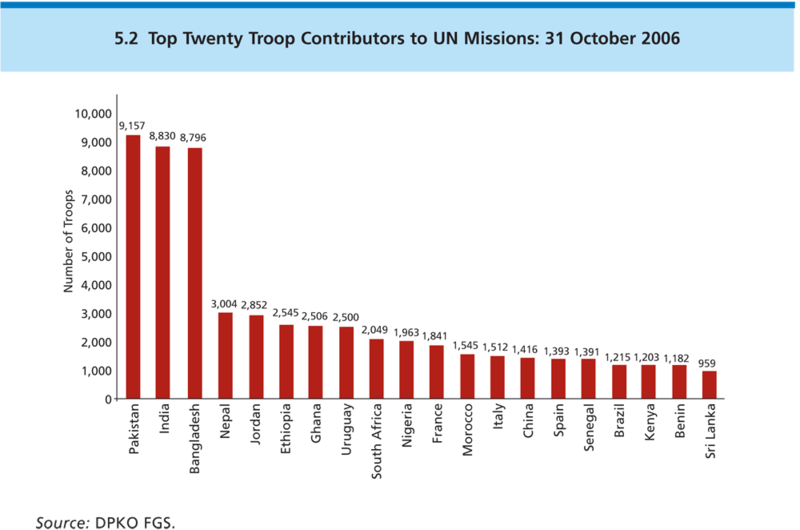 In October 2006, France, Italy, and Spain were all in the Top Twenty, mainly due to their contingents in UNIFIL in Lebanon. At the last United Nations summit on peacekeeping, in September 2015, Secretary-General Ban Ki-moon urged the international community to “explore every possible avenue to prevent conflicts before they begin,” by more efficiently and effectively supporting UN peacekeeping missions. In London on 8 September, representatives from more than 70 countries and international organizations will revisit Mr. Ban’s exhortation. They will assess peacekeeping progress, consider challenges, and coordinate on a way forward. There is no doubt that UN Peacekeeping has made substantial progress while protecting millions of civilians over the last several years and decades. The rise in peacekeeper presence has coincided with shortened conflicts and durable peace in many cases. However, hostilities continue to flare up from the Middle East to the Congo, in areas where peacekeeping missions may be able to have greater positive impact and truly prevent further conflicts before they begin. GPOR’s data supports the oft-cited notion that in many cases UN peacekeeping missions can and should be deployed more rapidly. It suggests that African missions in particular are sometimes deployed less efficiently than others when the pool of troop contributors is less broad. Of course, expeditious deployment is not enough on its own to achieve #BetterPeacekeeping. It is also essential that peacekeepers – and mission leaders – have a clear mandate, are well trained and equipped, stay focused, and use their resources wisely. But this data shows where UN Peacekeeping can improve and provides the tools to measure future progress. 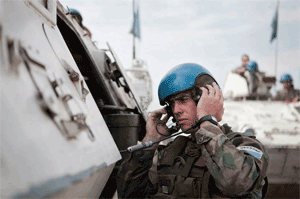 ← When should blue helmets walk away from a conflict?